Dance built round rivers and also numbers has claimed audience attention lately in the performance scene in the capital. River as a theme, down the ages has inspired poets, writers, painters, musicians and even philosophers. The rivers of India have nurtured cultures, while their unpredictability has also caused destruction from time to time. A dance enthusiast, Churchill Pandian’s latest favourite concept is what he calls Connecting Rivers Through Dance. If rivers flowing through areas causing endless political friction today could so easily be made to change track through dance to foster unity, life would indeed be easy! Ganga to Kaveri presented at Habitat Centre’s Stein auditorium, was however based more on myth with research work by Chitra Madhavan and Praveen Rao of Bengaluru providing the music. The producer’s earlier efforts with this theme, featuring individual groups representing different dance forms working out their own music, had met with patchy results. So he now came to the capital armed with the music. The theme with the top names of Delhi dancers associated with the presentation certainly drew a large audience – many enthusiastic hopeful viewers having to be turned away thanks to the packed Stein auditorium. The performer groups, only worked at the choreography - though one would have thought that the days of dancing to ‘Churchill’s tunes’ as it was humorously said, were well and truly over! Chhau dance that originated in the Purulia district in West Bengal and drew inspiration from martial arts and combative training has been used, down the corridors of time, as a means to portray mythical battle stories to the audience, which is why elaborate masks and headgear associated with fights and war are worn during the performance. Listed on UNESCO's world heritage list of dances, Purulia Chhau -- apart from being influenced by military movements -- was also influenced by a combination of regional dances. Their costumes were influenced to the extent of using more interesting clothes or fabrics to create the ensemble as well as using elaborate masks that were extremely creative. As their faces are covered by masks, dancers per force emote through body language. Taser Desh (Kingdom of Cards) performed by Creative Dance Workshop on May 13 in Kolkata, provided a brilliant idea to use the creative idiom of Purulia Chhau to visualise the dance drama penned by Rabindranath Tagore in 1933 and dedicated to Netaji Subhash Chandra Bose. They must have brainstormed, discussed, argued, practiced while conceptualizing short pieces as was evident when the number from One started materializing before the packed house. For three years, I conducted enquiries and studies based on 'Netra and Hasta' (eye and hand). I contacted all the living masters of Kerala, visiting some of them in their residences. Some of the masters came to Natanakairali to participate in the workshop. Many classes by the masters were held throughout these three years. Sessions by the maestros of Kathakali, Keezhpadam Kumaran Nair, Kalamandalam Ramankutty Nair, and Kavungal Chathunni Paniker were held. Kathakali artistes Sadanam Krishnankutty and V. P. Ramakrishnan Nair also held classes. Sessions in Kutiyattam led by Guru Ammannur Madhava Chakyar, Kidangoor Rama Chakyar and Ammannur Kuttan Chakyar, by Lakshmana Peruvannan on the 'Kannezhuthu' (painting of the eye) of Theyyam were held. Classes were also held at Tantra Vidya Peethom led by Brahmasree K. P. C. Narayana Bhattathiri. Acharya Gireesh Kumar's introduction to Sreevidya, the month-long practical classes by Lakshmanan Gurukkal on the Dasa Mudra-s of Sreevidya, classes by Swami Hari Om Ananda on 'Netra and Mudra in Yoga Vidya' and the session on the protection of eyes in Ayurveda by Swami Radhakrishna Chaithanya were all part of this three-year-long quest. It was an original way of looking at Bharatanatyam, with Bengaluru's Vyuti Dance Company at the Shri Ram Centre presenting the Delhi premiere of Sakhi, a group production which sought to be, and was, different from the usual Bharatanatyam recital. As a disciple of Leela Samson, Vyuti's founder Aranyani Bhargav's Bharatanatyam commitment has been unquestionable. While strongly affirming her loyalty to the dance form and its margam repertoire, she would seem to find its format, given its stylised entirety, too minutely structured for individual experimentation. Considering the almost insurmountably daunting challenges of trying to be original and standing out, within the solo presentational canvas, Aranyani and a group of Bharatanatyam dancers have got together to explore fresh ideas for presenting group expressions. In the process, they have harnessed two devices which strictly speaking, are outside the time honoured Bharatanatyam technique –one is the physical touch and contact, with two or even three dancers with arms linked performing as one unit. The single dancer's body even in interaction with more dancers on stage avoids physical contact in Bharatanatyam. Yet another device resorted to of lifts and elevations in the air saw a dancer being lofted off the floor. Negotiating between the group and solo, multiple and the singular, Sakhi contradictorily it would seem, aims at being different while not deviating from the prescribed Bharatanatyam technique. The concept of the existential philosophy, 'I am therefore you are,' took shape in form of Nayaka Pratinayaka by Aruna Mohanty in Odissi dance to the libretto written by Odiya poet/critic Kedar Mishra. When I first saw it in Bangalore, it made an impression on me. The memories were revived again when Aruna Mohanty presented it during Zohra Segal Arts Festival at IIC in New Delhi. When I was working on my book on Kathak for Abhinav Publications for exponents section, I had to gather information about the contemporary dancers. Keeping track of dancers by attending their performances and writing reviews I was aware of leading dancers. Contemporary of Maya Rao, Uma Sharma, Urmila Nagar, Kumudini Lakhia, Rashmi Vajpeyi, Shovana Narayan, Durgalal, Geetanjali Lal and others, Rani Karnaa's was an important name. In post independence era, Delhi had become a major centre for Kathak dance. Gurus like Narayan Prasad, Sunder Prasad of Jaipur gharana were training young dancers who were shining stars of Kathak. UNESCO has a healthy habit of reserving 24 hours for everything in the field of performing arts, so it is perhaps no surprise that there is an annual World Dance Day on April 29. It has been earmarked as a celebration for anyone who attaches "value and importance" to dance, and "acts as a wake-up call for governments, politicians and institutions which have not yet recognized its value". While this sounds just a little bit overboard, one would be surprised at how many places still frown upon, or outright ban, the act of dancing. Even in the open society of the USA, strict Southern Baptists do not dance, and this led to the famous work of Chicago teen Ren McCormack, who overcame the community through the medium of dance in a hard-hitting 1984 documentary, Footloose. Nearer home, Kolkata has the "creative" dancers of the metropolis using the prime location of Rabindra Sadan to offer kudos to the World Dance Day and render their presentations. 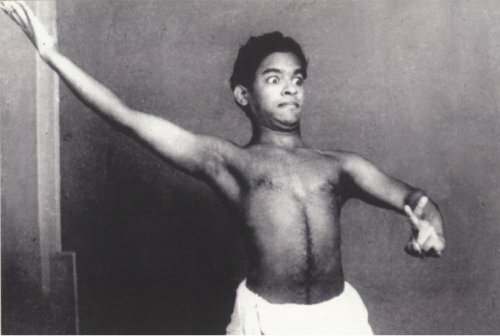 But surprisingly, as ruefully observed by Somnath Kutty (who directs the venerable Kalamandalam Kolkata for past 50 years), "The Rabindra Sadan celebrations normally exclude the classical dancers, so much so, that the latter tend to forsake their classical genres and present make-shift 'creative' forms at that venue!" World Dance Day presented on April 29 in Kolkata by Kalamandalam, comprised refreshingly just eleven classical dance groups, for a change. While noticing their performance, this critic also asked what the young classical dance choreographers looked forward to on this World Dance Day in terms of their rich heritage of given strengths: rigorous techniques, preponderantly mythological themes and traditional treatments. Did they contemplate changes - of any kind by way of "a wake-up call" - or did they seek to stick to their accustomed forte? Geeta Chandran and her institution Natya Vriksha celebrated World Dance Day on 28th and 29th April in collaboration with India International Center in their main auditorium in New Delhi. This was the 13th edition of their curating Young Dancers Festival, Dance Workshops, illustrated lectures and honouring persons with Lifetime Achievement Award. On both the days there was a record full house audience presence. In the morning at IIC’s Multipurpose hall on ground floor at Kamaladevi block, we saw active participation by more than 60 young dancers from 10am till 1pm, taking workshops from Delhi based theatre director Anuradha Kapur and Odissi exponent Sharmila Biswas from Kolkata. Shila Mehta, director of Nupur Zankar Kathak institute in Mumbai was trained in Kathak by Prahlad Das, father of Chitresh Das. She also studied under Chitresh Das and later on under Vijay Shankar, disciple of Birju Maharaj, for a number of years.For some time she also attended Kumudini Lakhia’s workshops. She moved to Mumbai 20 years ago and established her Kathak institute at Kandivali suburb in Mumbai. Today there are more than 100 students learning Kathak at her institute. When Shila’s husband moved to Princeton, New Jersey, she opened a branch of Nupur Zankar there, dividing time between USA and India. She also regularly visits Belgium and has opened a branch there at Ghent, visiting it to train Belgian dancers interested in Kathak. 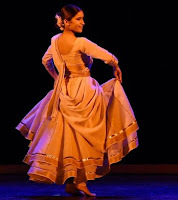 ICCR sends students from abroad wanting to learn Kathak to Nupur Zankar. Shila consulted the celebrated Kathakali and Mohiniattam exponent Dr Kanak Rele in Mumbai for suggestions on mythological story of Shikhandi from Mahabharata to present in Kathak. Kanak Rele has choreographed it in Mohiniattam and her disciple Sunanda Nair has successfully presented it in Mumbai and abroad. Kanak Rele has also performed it earlier. The issue of third gender has drawn attention in recent years. The third gender community has suffered a lot and has been treated in a despicable manner by society. But of late, this community has come into its own and has asserted its rights. It is accepted that soul is above gender and therefore they need not be despised. So far such a theme has not been attempted in Kathak. Lately there have been festivals held at the ICCR premises in Delhi, which have made one ponder on a few points. Ultimately to have the kind of mindset where one dances for one's own joy, no matter who is watching or not watching the effort, is great. But when a festival is planned and one sees half a dozen persons seated in the hall, one is left wondering as to who benefits from an enterprise of this nature. 'Nritya Dhara' mounted by Sanskriti Bhuvaneswar, and publicised under the category India International Dance Festival, when I entered the auditorium at 6.30pm had just about half a dozen persons watching. Looking at the purposeful performance of Mayurbhanj Chhau dancers Alexandra and her partner (whose name was not clear) well trained disciples of Janmejoy Saibabu, presenting an Arjun/Krishna dialogue in complete costume regalia, I at first thought it was a dress rehearsal before the truth dawned on me that this was the festival in progress! Sitting through the evening one witnessed formalities of a special certificate of participation awarded to each performer by a chief guest (!) and all the courtesies were observed meticulously. But one was at a loss for so much being done ultimately for so little. Was this kind of an event which was mounted with a lot of effort with many talented dancers performing, really worth it in terms of getting hitherto unknown dancers into the radar of the Delhi circuit to be noticed by culture czars? Excepting for the venue's ICCR association, it is so far outside the usual complex of performance centres, that it is well nigh impossible to attract even modest audiences for events planned here. Shivani Varma has a slim and petite frame, and her big smile tells you she is an affable person. She performed at the India Habitat Centre, Delhi, on the 6th of March in a thematic production called ‘Champaran Se Bapu,’ her own choreography in Kathak. Shivani, a lawyer by profession, has learnt Kathak from Uma Sharma’s academy and is a disciple of Shovana Narayan. She has performed in several solo and group presentations to critical acclaim. I recently started this exercise of listening to people who are working with the dancer and supporting her in the formation of her production. I’m calling this the Building Blocks series of interviews, in which artists explain how they contribute to constructing a production. The first thing that comes to mind is the concept of any production. Who develops the concept, gives it the conceptual framework? Who puts in that squiggly worm, or keeda, in the dancer’s head to not just do a traditional piece, but make a production? Is the pure margam or pure dance piece not as enthralling to the audience? I think it is equally gripping. But a thematic performance is more captivating since it makes you relate to the performance as a person, and more so if it does not stray from its classical form. And of course, the dancer is always uncertain in such cases about the success of the production and the process of relating to the audience. It does not happen so frequently to leave a hall in a disturbed state of mind during a performance and when it happens a strong reason must exist. It happened to me few days ago, but before describing the circumstances, let me introduce the matter. We are quite accustomed nowadays to see the makings and re-makings of dance items which, originally created for solo dancing, are being split into groups, duets, diagonal formations, alternate rendering, fused with other pieces and what not. I am not sure if this happens in other dance styles as well but in Odissi it seems to be the heaven for aspiring choreographers. Take one solo item, break it up, change it a little here and there according to whatever you remember or whatever you need and present it as group choreography. There is still a little bit of reserve in announcing the credits (original choreographer may be given credit in spite of all the distortions or alterations) but that’s all. It seems everything is admissible and permitted. April arrived and departed in a blaze of dance events. Even with the mercury touching 45 degrees in some parts of India, hundreds of dancers were marking WORLD DANCE DAY- April 29th - with endless performances and dance-centric events. Certainly, this day could not have been dreamed up by anyone in Asia! For this performer, just rehearsing daily became difficult in my semi open air studio, with face and limbs soaked in perspiration even as early at 7.30am! Still, the experience of recollecting and reviving 3 early dance compositions of my guru Adyar K Lakshman and the original creative team of musicians Madurai Sethuraman, Madurai N Krishnan and genius percussionist Trichur Ramanathan, was a sweet ride down memory lane - albeit slippery with sweat!